Let’s cover the different types of braces for kids, teens and adults, today. If so, the choices when it comes to kinds of braces can feel overwhelming to choose from. Narrowing it down to just one or two may seem impossible to do on your own. While they’ve evolved a bit over the past several decades, the different types of braces that most people are familiar with are the traditional ones made out of metal brackets and wires. Conventional orthodontics work well for patients of all ages and bite needs. Whether you have minor tooth misalignment or a more severe bite discrepancy, metal braces can be customized to bring your occlusion (biting relationship) into a healthy and harmonious position. The length and extent of your treatment will be the biggest factor when it comes to the overall costs. Take the clear or colored rubber bands and ligatures away from your conventional orthodontic system, add a trap-door design that allows each bracket to snap over your archwire, and you have self-ligating braces! Self-ligating bracket designs allow the archwire to “float” between the teeth, rather than pull/push on individual ones. This design means improved comfort for our patients and an efficient system that moves all of the teeth systematically. Thanks to memory archwire, your smile responds in a gentler and more efficient timeframe. They’re a low-profile option for people who want a subtler orthodontic solution. During your consultation, we’ll provide you with an estimate of the overall treatment, which ranges from as low as $3,500 to $7,500 with an average of $5,500. If you were to take traditional braces and make them out of clear coloured ceramic products, you would have an excellent cosmetic option that was less noticeable on your teeth. Ceramic options are available for self-ligating braces as well. Like clear ceramic braces, the self-ligating versions also blend in with the color of your natural tooth enamel. These kinds of braces work just like metal orthodontics do but provide an added aesthetic advantage of being an accessory most people won’t notice during everyday conversations. Depending on your situation, some ceramic kinds of braces can include tooth-coloured archwiress to go along with them. That way there’s not still a thin metal band spanning across your smile. This isn’t always an option, but if it is, it can make your ceramic orthodontics “clearer”. Ceramic braces add just a slightly higher fee to your orthodontic treatment, because of the types of materials that are involved. Fortunately, they’re still modestly priced and a great investment for our patients who want a more cosmetic alternative to metal braces. Pricing ranges from as low as $3,800 to $7,800 with an average of $5,800. Lingual braces are tucked behind your teeth to make them practically invisible to everyone else, these kinds of braces feature customized brackets made to fit the tongue-side surfaces of your smile. Lingual orthodontics work just like traditional types of braces, except they’re on the back of your teeth instead of the front of them. Because of this design, they can take a bit more time to clean and get used to. But they’re a proven and effective treatment for our patients who require conventional braces yet still prefer a design that other people won’t see during everyday encounters. Because of the customized design process that’s involved, lingual braces ranges from as low as $5,800 to $9,800 with an average of $7,800. 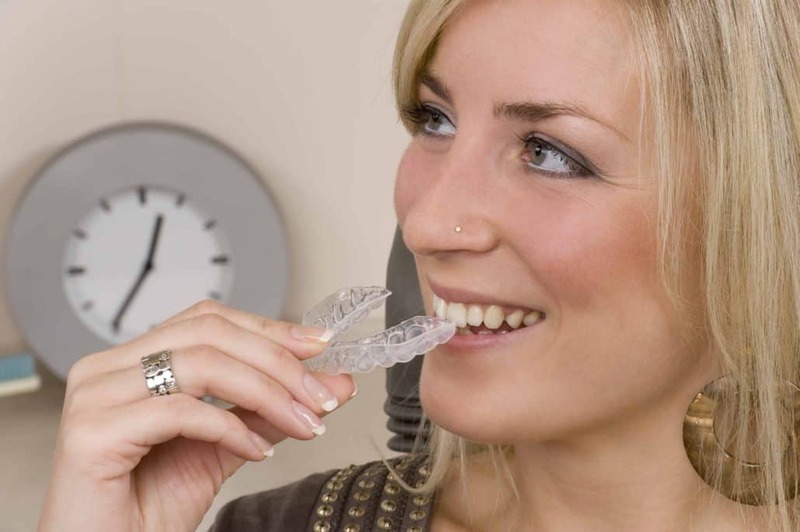 Invisalign is the most familiar type of translucent, removable orthodontic system. However, they are not the only kinds of braces that use clear trays. Several other brands have been based on the Invisalign program, yet these effective products continue to be the leader in the industry. Unlike bracket and wire systems, clear aligners reposition teeth by wearing a new set of retainer-like trays every one to two weeks. Minor changes in each set of aligners helps guide teeth into the ideal position. Since they’re removable, there’s more flexibility when it comes to maintenance, home hygiene, and meals. While Invisalign was originally designed for minor to moderate tooth movement needs, the expanding technology makes options available for our patients with more complex bites as well. Plus, the Invisalign Teen line provides added perks to younger patients, including wear indicators and replacements for when a tray is accidentally misplaced. As Invisalign has become more advanced and available to patients, their prices have also become more competitive. Treatments range from as low as $4,000 to $8,000 with an average of $6,000. Are there different types of braces that you can wear for shorter periods of time, just to fix the teeth at the front of your mouth? Short-term or accelerated orthodontics is a problem-focused type of treatment that is restricted to aligning the teeth that people see first: the ones at the front of your smile. Because accelerated orthodontics are only for cosmetic purposes, they do not address the alignment and positioning of your back teeth, as different types of braces may. As a result, you can typically finish your treatment in as few as 4 – 6 months. Consequently, treatments may cost as little as $2,800. More than likely, there are different types of braces that are appropriate for your unique needs. The ideal way to find out which types of braces would work best is to see our Barrhaven orthodontist for a free consultation. At Braces Haven, we’ll discuss your immediate needs, long term goals, and budget to help you select the best types of braces for your smile’s future. Contact our Barrhaven practice today to schedule your first visit!